Thomas Anthony Colella (July 3, 1918 – May 15, 1992) was an American football halfback and punter in the National Football League (NFL) and All-America Football Conference (AAFC) for the Detroit Lions, Cleveland Rams, Cleveland Browns and Buffalo Bills. Colella grew up in New York and was a high school football star in his hometown of Albion. He played four years of college football at Canisius College in Buffalo, New York before being drafted by the NFL's Detroit Lions. He was on the Lions' roster for two years, after which he moved to the Rams in 1945 and the Browns of the AAFC in 1946. Colella stayed with the Browns for three years, in each of which the team won the AAFC championship. He spent the 1949 season with the Buffalo Bills before leaving football. Colella grew up in Albion, New York, and played three sports at the city's Charles D'Amico High School Was referenced as "The Albion Antilope". After graduating, he attended Canisius College in Buffalo, New York, where he was a versatile football player for four years. He was a running back, quarterback, defensive back, kicker and kick-return man at the school, and won Little All-America honors three years in a row. He returned a kickoff for a touchdown and kicked two extra points in a Canisius Golden Griffins win over the then-undefeated Long Island Blackbirds in 1940. Collella was drafted by the National Football League's Detroit Lions in 1942, and played two seasons for the team. The Cleveland Rams acquired him in 1944. He played as a halfback and punter for the Rams, who won the NFL championship in 1945. The Cleveland Browns, a new team under formation in the All-America Football Conference, signed Colella soon after the 1945 season ended. He was among five players who joined the Browns when the Rams moved to Los Angeles before the 1946 season; the others were Chet Adams, Don Greenwood, Mike Scarry and Gaylon Smith. With the Browns, Colella was a punter and defensive halfback between 1946 and 1948. Colella had 10 interceptions in 1946, leading the AAFC. Cleveland coach Paul Brown said in 1948 that Colella provided "the type of punt we want against such dangerous receivers as the Rockets and Buffalo Bills have. All of his kicks have gone out of bounds, and our opponents have gained exactly no yards on returns in the last two games." Cleveland won the AAFC championship in each of the three seasons he was with the team. 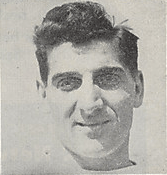 Colella was traded to the Buffalo Bills in May 1949 along with Chet Adams, his former Rams teammate. "We have won three championships, but we can't remain at a standstill," Brown said. He played one season for the Bills before leaving football. In the 1950s, Colella stayed in Buffalo and worked as a salesman. Colella was inducted into the Canisius College Athletics Hall of Fame as part of its inaugural class in 1963. He was inducted into the Greater Buffalo Sports Hall of Fame in 2002, ten years after his death. 1 2 3 4 5 "Tom Colella". Greater Buffalo Sports Hall of Fame. Archived from the original on October 6, 2012. Retrieved July 31, 2012. 1 2 3 "Tom Colella NFL Statistics". Pro-Football-Reference.com. Archived from the original on October 6, 2012. Retrieved July 26, 2012. ↑ "Colella Stars in Rams Workout". Cleveland Plain Dealer. August 23, 1944. p. 14. Tommy Colella, triple-threat halfback obtained from the Detroit Lions, sparkled as the Cleveland Rams scrimmaged yesterday at Hiram. ↑ Dietrich, John (October 5, 1944). "2 Topnotch Punters Give Rams Chance to Jolt Bears". Cleveland Plain Dealer. p. 16. In Albie Reisz, the rookie from Lorain, and Tommy Colella, who was acquired from the Detroit Lions early in the season, the Rams have two of the best punters in the league – maybe the best. ... Colella has proved himself to be an outstanding climax runner, a fine passer and a great kicker. ↑ Dietrich, John (July 30, 1946). "Graham, Schwenk, Lewis Hope to 'T' Off For Browns". Cleveland Plain Dealer. p. 15. Tommy Colella, fleet halfback of the Rams in 1944 and 1945, who signed with the Browns shortly after the close of last season, got in today and worked out. ↑ Piascik 2007, p. 26. ↑ Piascik 2007, p. 65. ↑ Sauerbrei, Harold (September 21, 1948). "Brown Calls Deal for Boedeker His Best". Cleveland Plain Dealer. p. 18. ↑ Piascik 2007, pp. 64, 81, 121. 1 2 "Colella, Adams Sold to Buffalo". Cleveland Plain Dealer. May 28, 1949. p. 15. ↑ Heaton, Chuck (November 30, 1959). "Football Footnotes". Cleveland Plain Dealer. p. 34. ↑ "Canisius College Athletics Hall of Fame". Canisius College. Archived from the original on October 6, 2012. Retrieved July 31, 2012.